Did you ever wonder how Mother’s Day became a holiday? Or are you wondering what to make your mom for this special day? Well, here’s an answer and a gift idea! Over 100 years ago – in 1908 – a lady named Anna Jarvis held a special ceremony to remember her mother. Anna’s mother had died a few years before, and Anna wanted to honor her by establishing an official day to celebrate mom’s and their care role in their children’s lives. West Virginia was the first state to make the celebration of Mother’s Day official, and, in 1914 President Woodrow Wilson made Mother’s Day a United States’ holiday. 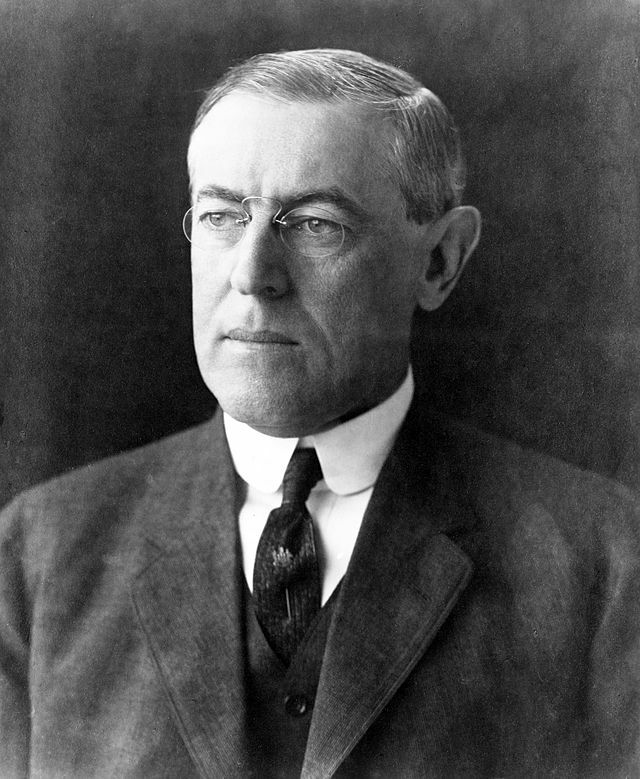 President Wilson proclaimed that Mother’s Day would always be on the 2nd Sunday of May. I think that’s a great time for the holiday because so many flowers are blooming and it’s easy to make pretty bouquets to decorate the house or bring to Mom! A few years later Anna Jarvis became very upset and said that people weren’t celebrating the holiday properly. You see, Anna wanted to people to express gratitude (that’s a big word for “being thankful”) to their moms by making them something special or doing something to show how much they loved their mothers. Anna didn’t like that the stores were convincing people it was okay to buy cards and little gifts; she wanted the presents to be from the heart – in other words, something that we take time to create or plan to make special. Place waxpaper on the table to protect the table from any messy glue. Make sure the jar is clean and dry. Remove the lid; you won’t need it. 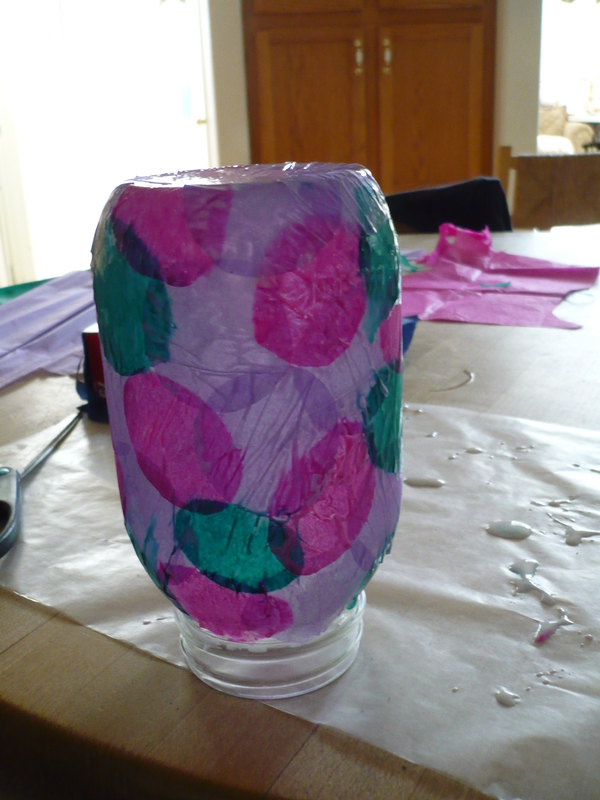 Squeeze some glue into the cup and mix with a little water to thin it down. 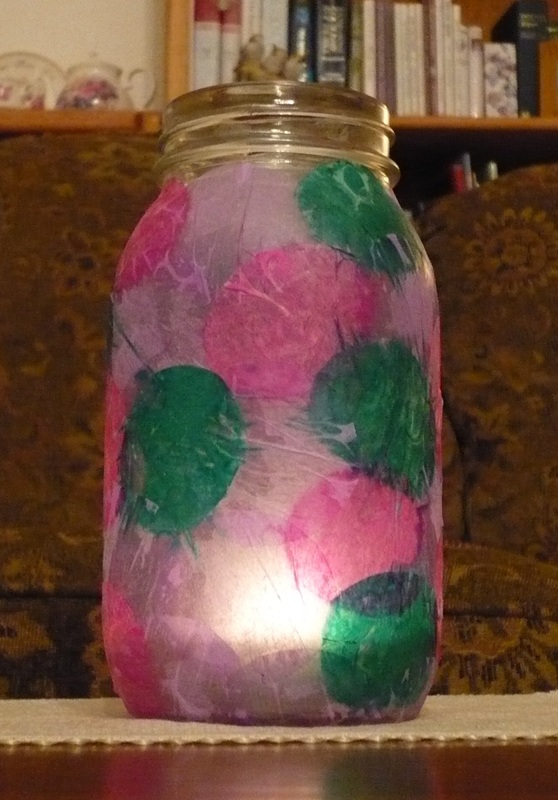 Use the foam brush and paint the glue/water mixture on the jar, starting at the top. Don’t paint the whole jar at one time, just the section you’re working on. Place the cut tissue paper on the glue and smooth the edges down. You can use a little of glue to help the edges stick. Make sure to overlap the paper edges. Work all the way around the jar. 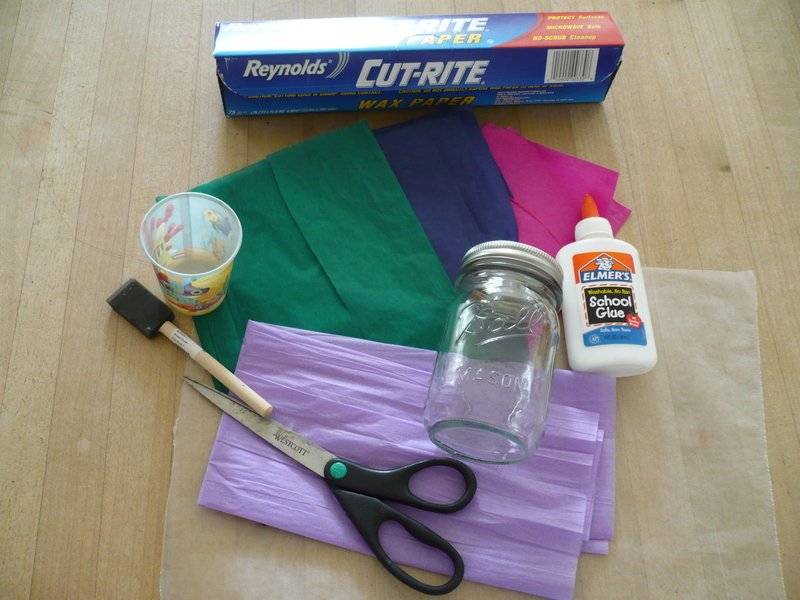 Some tissue paper colors may “bleed” if they get excess glue on them; it will probably be okay. When you get to the bottom of the jar, turn it upside down. 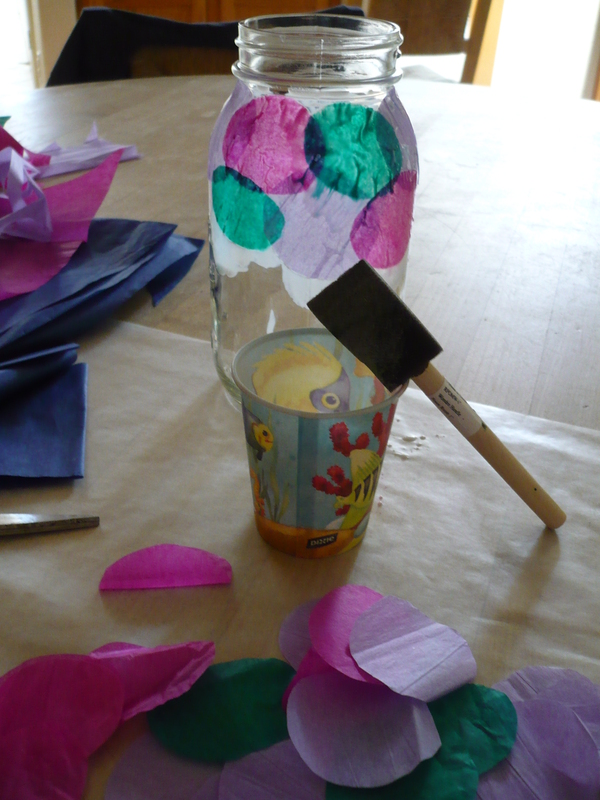 Fold the extra tissue paper to the underside and plaster firmly in place with the glue mixture. Find some tea light candles to include with your “Stained Glass” Candle Holder. Wrap and make a card. Mother’s Day gift is complete!